We needed coffee so I did the dangerous thing and went to Grocery Outlet. 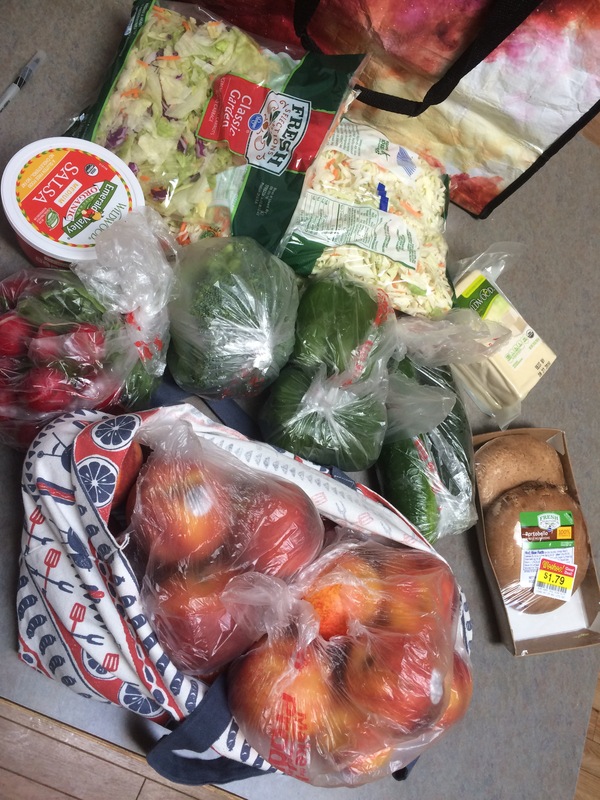 This is not my “healthiest” trip to the store but I’m reasonably sure everything is vegan. If you see something you know isn’t, please tell me. Even after 2 plus years I am still learning. I try to stay “whole food plant based” but sometimes you need something for convenience. I spent $45.24 ($45). I am excited about those pickles because there is no yellow dye in them. I believe organic and raw would be best but that is hard to find at a decent price. I will settle, right now, for no dye. 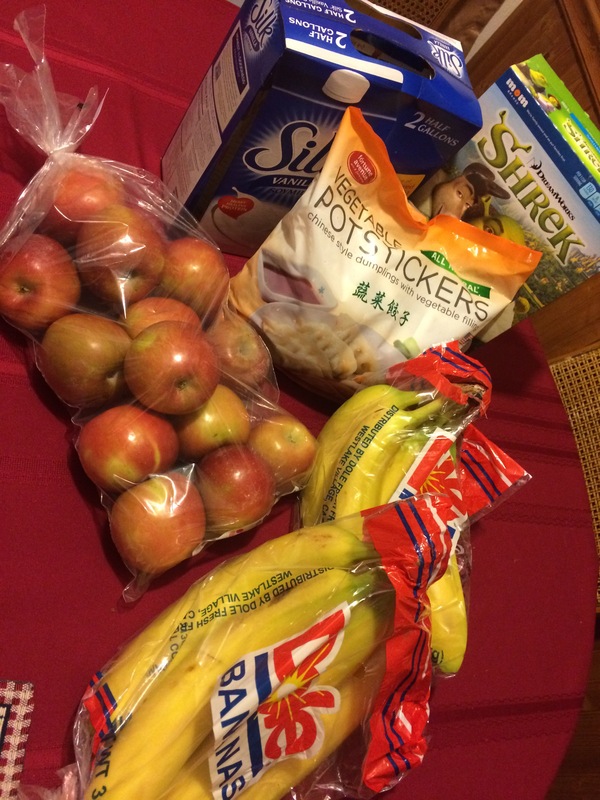 Have you been to Grocery Outlet lately? What was your favorite find? This was a frantic shopping trip. I missed out on several coupons because the kids were tired of running around and yet I couldn’t not go shopping. We were out of fruit and there were several things on sale I like to have around. I spent $47.83 ($48). The kids are very happy when I buy grapes. They love grapes. What do you do when your kids are crazy but you have to go shopping? It can be a real challenge somedays. Sometimes we have to be flexible with our shopping routine. Over Labor Day, Vitacost was having a sale. I buy my vitamins from them because they have the best deals. I decided to see if I could find some groceries. I’m struggling finding a good vegan, cruelty free shampoo that doesn’t break the bank. 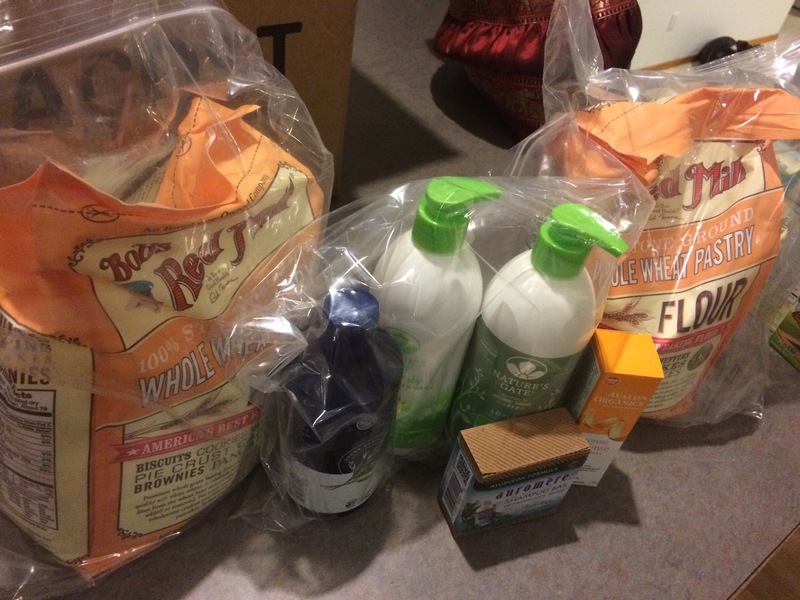 I purchased 2 different types from them, as well as baby wash and hand lotion. Plus, the flour was a decent price. I spent $34 on groceries from them. I am not impressed with the Avalon Organic shampoo yet but I’m going to try it for awhile and see. The shampoo bar seems exciting, also. Have you ever tried Vitacost? They will give $10 off $30 for new customers. It is worth a look around at what they have with that deal. Maybe you could find something you like. This last month was crazy, with getting settled. Now that it is September and we have been in our new home for almost 6 weeks, things feel like normal. Looking at my budget for August, though, gives me anxiety. 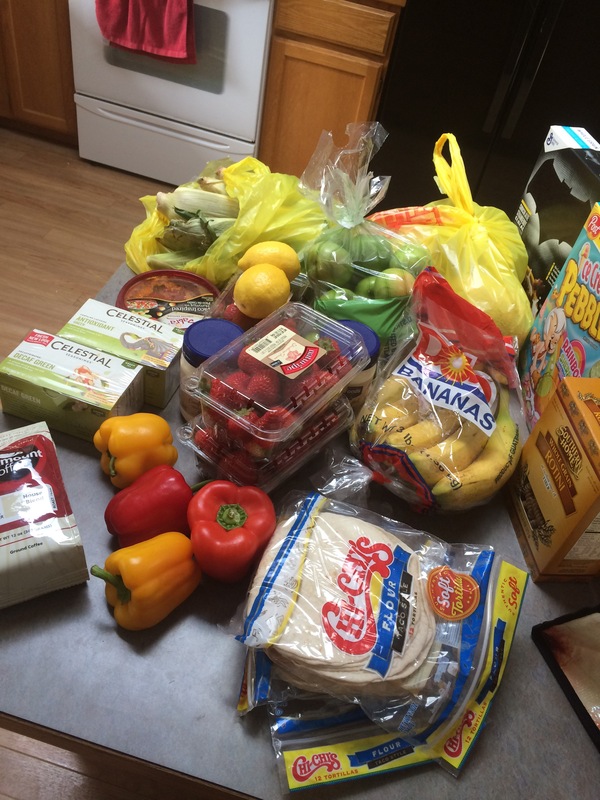 I spent more in 1 month then I have in years, not just on groceries. I, also, know that there were things I forgot to write down. All the numbers aren’t adding up. I will get everything figured out as September comes to a close but right now, it is very overwhelming. I am not going to link every shopping trip this month. I need to move on but I will share what I spent. Please understand that I don’t think this is accurate. I think I missed things or double counted things. The goal has always been to give people a rough idea what I spend every month and how this lifestyle, most of the time, is actually the most cost effective. For the month of August I spent $624. That breaks down to around $125 a person this month. There were 28 days for August, which breaks down to $4.45 per person per day. For the first time ever, I am over the $4 a day mark. I hope September isn’t nearly as expensive. How did August turn out for you? Do you even keep track of your monthly expenses like this? I went to Fred Meyer for 99 cents a pound grapes. Oops! I spent $57. That is quite a difference from what was in the plan. We will eat it all and some of it was taking advantage of sale and coupons, so I never spent full price. I still spent too much. How often do you go to the store for one thing and come out with a lot more? My husband needed to go to Costco, so offered to go for him. The problem is that I spent $153. Oops! 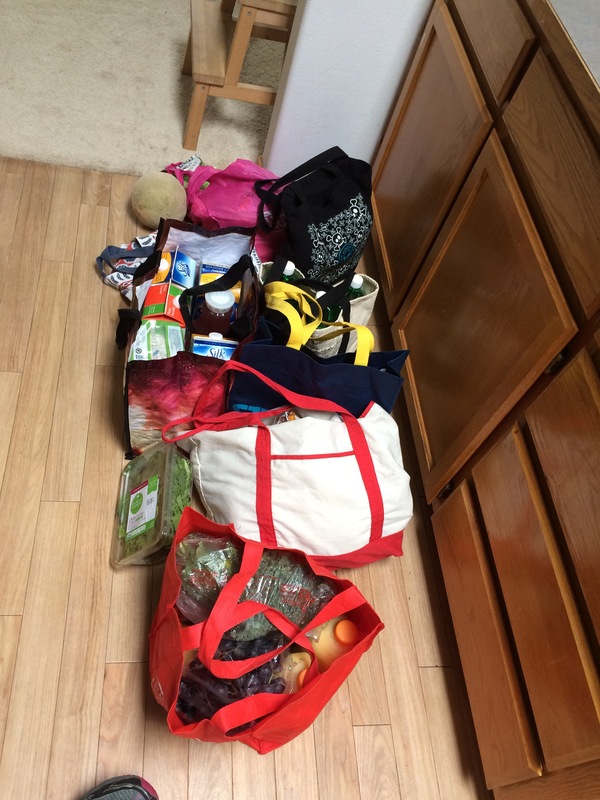 I got several things for the home and school.For groceries, I spent $90. I am super excited about having my air poppers (yes, I have more then 1) out of storage and we can have popcorn again! Is there a snack you make and get excited about? Is there a kitchen appliance you hoard? I have 3 crockpots and 2 air poppers. It has been 13 days since my last post. I believe that is the longest I have gone without posting since I started this adventure in October. I have some catching up to do. 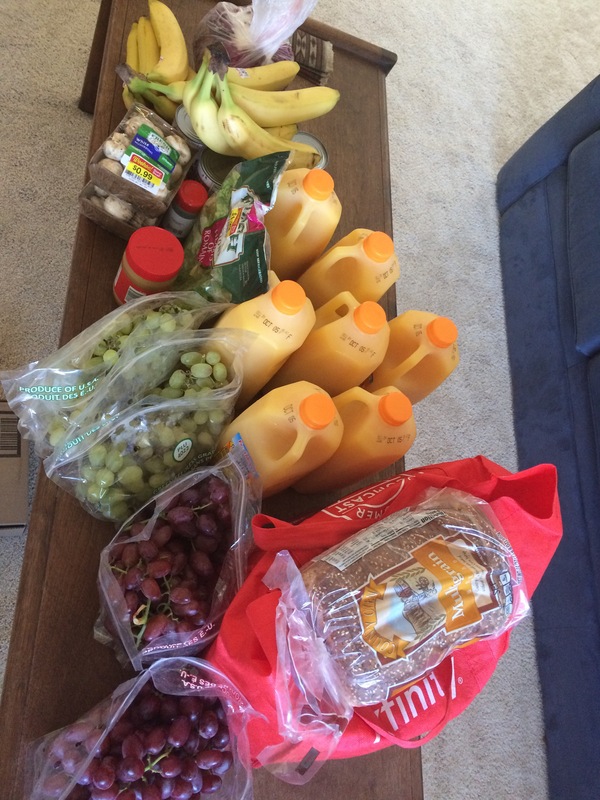 Below are pictures of both Grocery Outlet trip and Fred Meyer trip but I did go to the bread outlet and Target. Things were crazy with getting settled and having company that I never got a chance to take pictures. Try to ignore the junk cereal at the side. LOL.. I did check it out and it appears to be vegan but certainly not good for us. All the trips together, I spent about $111.00. That’s seems okay for 2 weeks total of shopping. I’m hoping to not shop for a little while now and really concentrate on getting settled. Are there things in your life right now distracting you from the things you enjoy? What has the bulk of your attention? I was really close to 3 bonuses on Ibotta *referral link* so I decided to venture out to Target to see what I could fine to put me over the top. 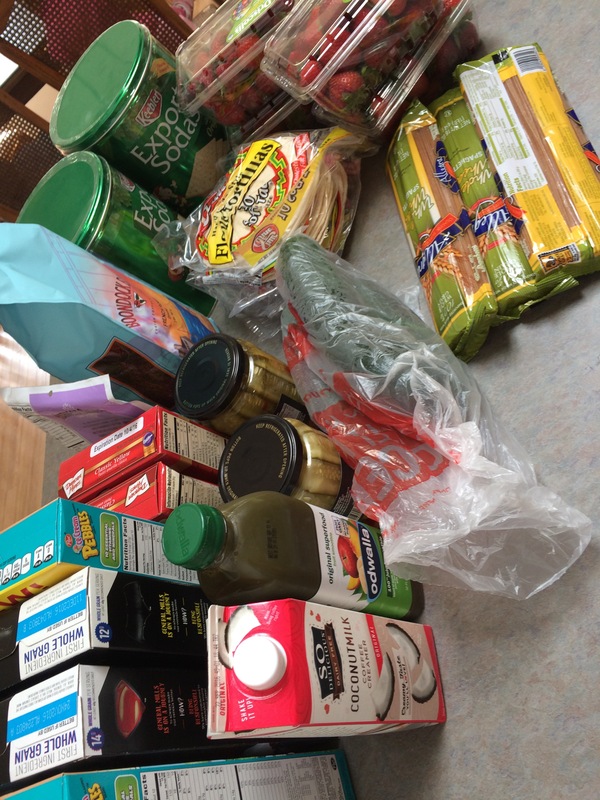 I spent $20.47 ($20). 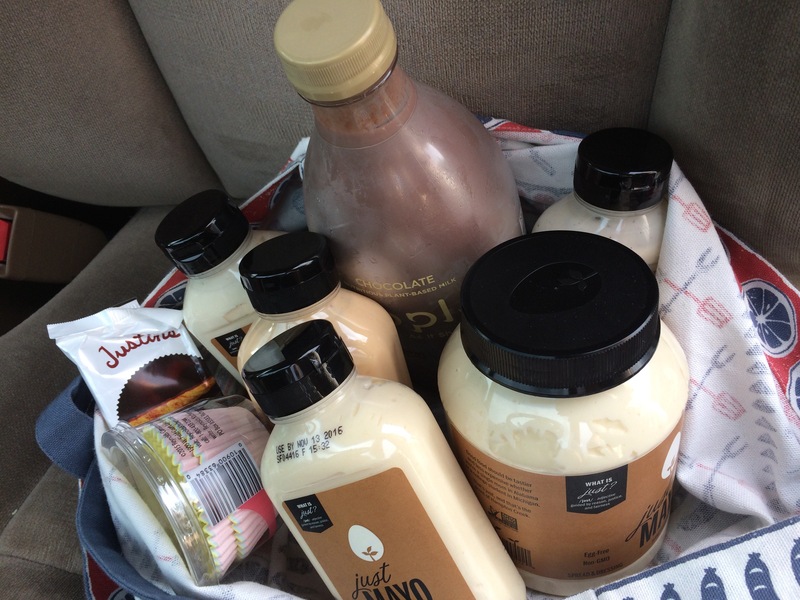 I am well stocked on mayo and dressing now. I tried some new plant-based milk called Ripple because of an Ibotta for it. Well, I actually haven’t tried it yet but my son has just about drank the whole jug. It was pricier than I like but I was curious. It is made from yellow peas. Hopefully I get to try some. I received a total of $13.25 back from Ibotta on this trip. That may have made this trip worth it. Have you tried Ibotta yet? If you haven’t, what is keeping you from trying it? I massively overbooked myself. Yesterday, we were having something delivered between 7 and 9 and then a friend was visiting at 10. The delivery was done before 8 and I thought “Great! I can still go to the grocery store and post office before my friend gets here.” Needless to say, I didn’t actually have time. It is Fred Meyer’s friend’s and family sale and that meant 10% off natural foods and private label. So I needed time to really look. Not a great choice when you are in a hurry. I spent $71.85 ($72) on everything. 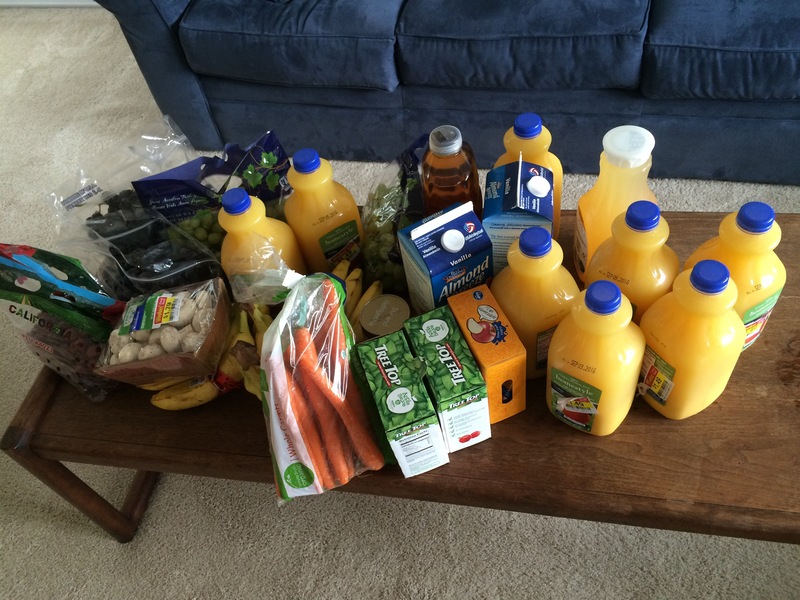 Most notable items were $.90 orange juice, cantaloupe $1.50 each and Silk under $2.00 a half gallon with e-coupon. That is 7 bags of groceries (and toilet paper) for $72 and some of those bags are pretty large. I did receive $4.50 back from Ibotta *referral link* today as well. This was a good trip, despite the fact that I was in a hurry. I dragged the kids on a million errands the other day. Its was a little crazy. I decided to do a restock at Costco. Costco doesn’t carry everything we eat but it is a great place to get a good deal on many things. 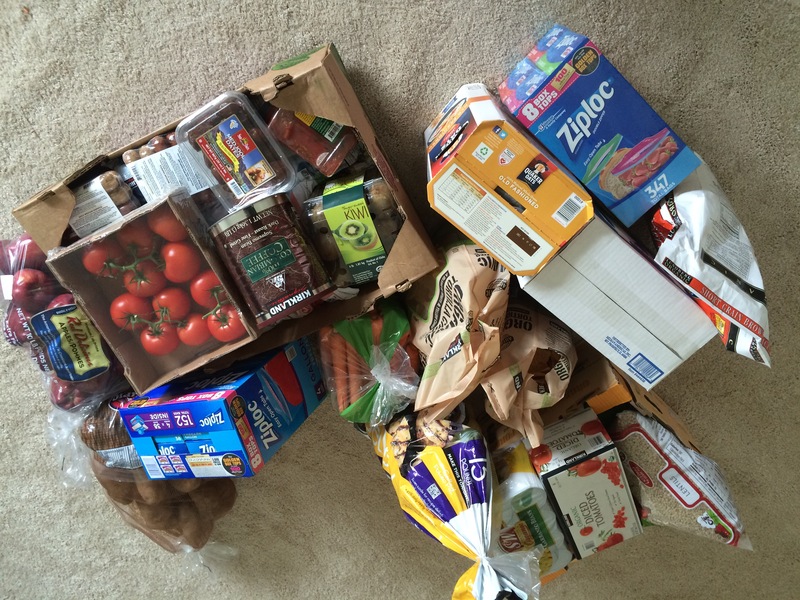 I spent $271 on groceries there! OUCH! It is so nice to have choices on what to eat now. I made large baked potatoes with lentils and taco fixing the other night for dinner. I haven’t had lentils in a long time. My body loves them. Is there a food your body loves? 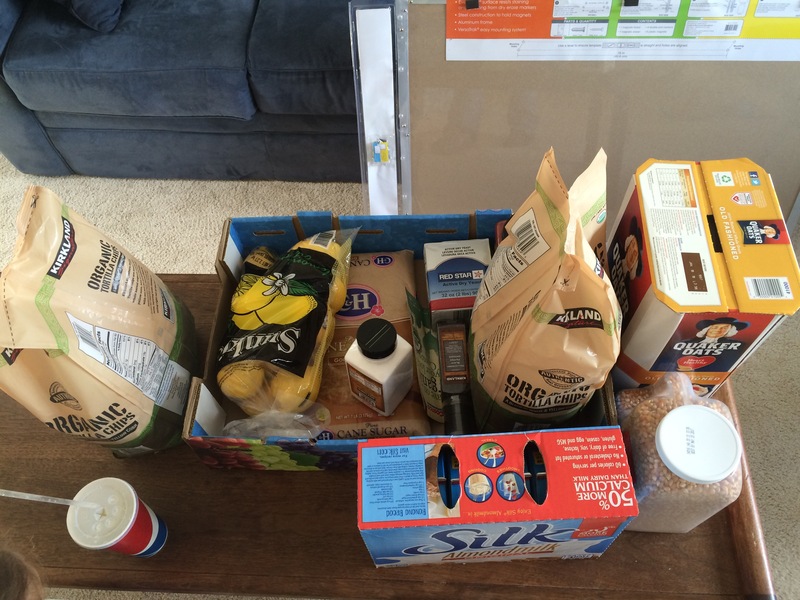 When was the last time you had to do a major pantry restock? I’m in love with my full pantry.